When I was younger, I loved mail. I’d send out cereal boxtops and enter contests to ensure a constant stream of overstuffed, padded envelopes. I’d receive all kinds of goodness: a Tony the Tiger baseball, a Kool-Aid cup (Oh Yeeaahhh! ), and even X-Men Figurines. It was like celebrating mini Christmases all year long, and I loved it. These days, mail isn’t quite as thrilling. Bills? Booo, hisss! Junk mail? Yawn. Every once in a while, however, I still get to celebrate a mini-Christmas moment. Today was one of those days. 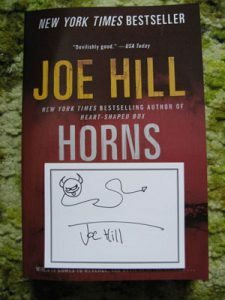 First, in an unassuming envelope, I found a signed bookplate from none other than Joe Hill. It was part of a promotion for the sale of his paperback, HORNS. Word of advice: if you haven’t read this novel yet, don’t wait any longer. You’re doing yourself a disservice. Second, I found the contributor’s copy of my chapbook, UPROOTED. Mr. Aaron Polson did an amazing job with the cover art. I find myself glancing at the book every now and then to make sure it’s real. If you’re interested in obtaining a copy, I’m told there are only three or four left, so order soon. It contains three of my short stories and is both signed and numbered. If you have already purchased a copy, the books are currently shipping. In fact, there have even been a couple sightings in the wild.